FILE- Soldiers patrol in the streets of Buea, South West Region of Cameroon, April 26, 2018. 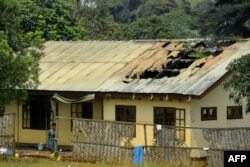 Saint Joseph's College near Buea was attacked late Sunday, a government official reported Monday. Armed men attacked a school in Cameroon's southwest English-speaking region, wounding more than 20 people, a government official said Monday. An unknown number of armed men, using machetes and homemade guns, staged the attack on Saint Joseph's College near Buea late Sunday, according to South West Region governor Bernard Okalia Bilai. No one was killed, he said. The wounded children were rushed to hospitals and hundreds of parents started pulling their children from schools. "It is a terrible situation. We are not safe at home, our children not safe at school," said Enanga Luisy, a mother of two students. At least half a dozen schools in Buea have asked parents to take their children home. The violence comes weeks ahead of Cameroon's Oct. 7 presidential elections that separatists say should not take place. FILE - A woman stands outside the damaged roof of a school's dormitory after it was started on fire overnight in Bafut, in the northwest English-speaking region of Cameroon, Nov. 15, 2017. At least 70 schools have been torched since a crisis began in Cameroon's English-speaking northwest and southwest areas in 2016 when teachers and lawyers protested the overbearing use of the French language in the bilingual country. Separatists then took up the cause, arming themselves and demanding a separate English-speaking state they call Ambazonia. More than 300 people, including soldiers and police, have been killed in mounting violence since. Thousands have been fleeing from the northwest and southwest areas but the government is urging them to return, saying their security is assured.